It wasn’t even a contest. How could a bird with the name Tufted Titmouse be a true threat? 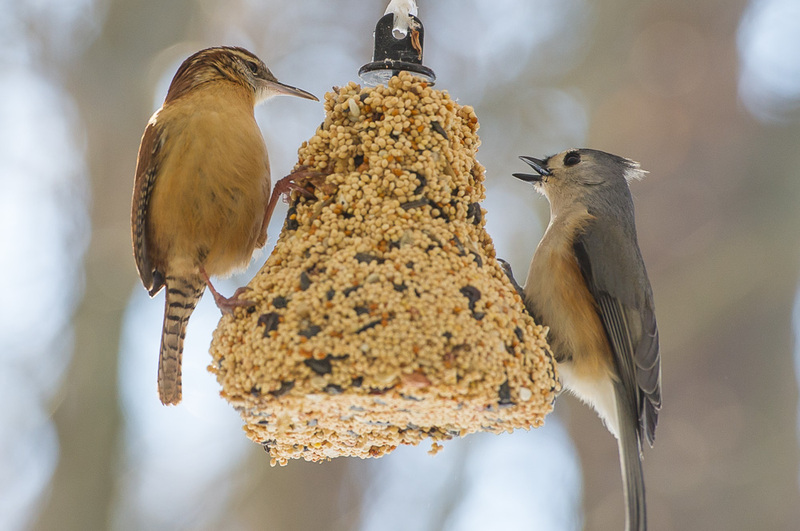 Each time the Carolina Wren alighted on the bell, the Tufted Titmouse retreated. But a few times he tried his best to seem intimidating, even squeaking a verbal warning a few times. But it was like the Wren just laughed, climbed a little higher, leaned over, and that was all it took for the Titmouse to quickly retreat to a nearby bush to wait for him to finish. The action at the birdseed bell has been quite entertaining this week. I hung it just outside my office window, so I can sit at my desk and keep an eye on the birds as I work. With the Wren vs. the Titmouse vs. the Dark-Eyed Junco, it’s like having Animal Planet on in the background but better!